On May 12, Rotary Playa del Carmen Seaside will be participating with other Quintana Roo Rotary Clubs in the Grand Rubber Ducky Regatta! First prize is a house in Cancun!!! 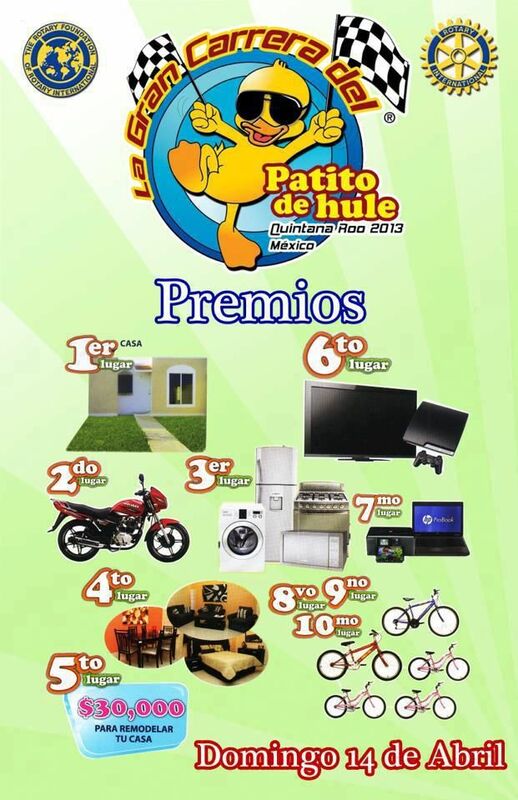 Additional awesome prizes include a motorbike, home appliances, furniture packages, flatscreen TVs and much more! Be sure to buy your Rubber Ducky to participate - $120 pesos each! Ducks are available locally from Rotary Club members. Email pdcrotary@hotmail.com for more info or inquire on the Rotary Club Facebook page. You don't have to be in Playa del Carmen to participate in the Rubber Ducky Regatta! You can get in the race from anywhere in the world by adopting a duck or ducks! Each duck adoption is $10US or $120MX. A PayPal account has been established for easy payment via credit card. There is no limit to the number of ducks you may adopt! Once you adopt and make payment, your Rubber Ducky race number(s) and a photo of your souvenir duck(s) will be emailed to you! If you like, give us your address and we will mail them to you when a Rotary member returns to the US/Canada. Be sure to check the Facebook page - Rotary Playa del Carmen Seaside - on May 12 as fun photos and the race results will be posted. Ducks have been adopted from all over Canada and the US. Don't miss it! Proceeds from Seaside Chapter's sales will go toward ongoing projects and providing computers, learning software programs and essential school supplies to Playa del Carmen's less fortunate school children! Read HERE for more information on these important Rotary programs.